Last week, AIA Baltimore presented the inaugural Social Equity Design Award to Cho Benn Holback + Associates (CBH), a Quinn Evans Architects company (QEA), in recognition of their design for the Dorothy I. Height Elementary School in West Baltimore. 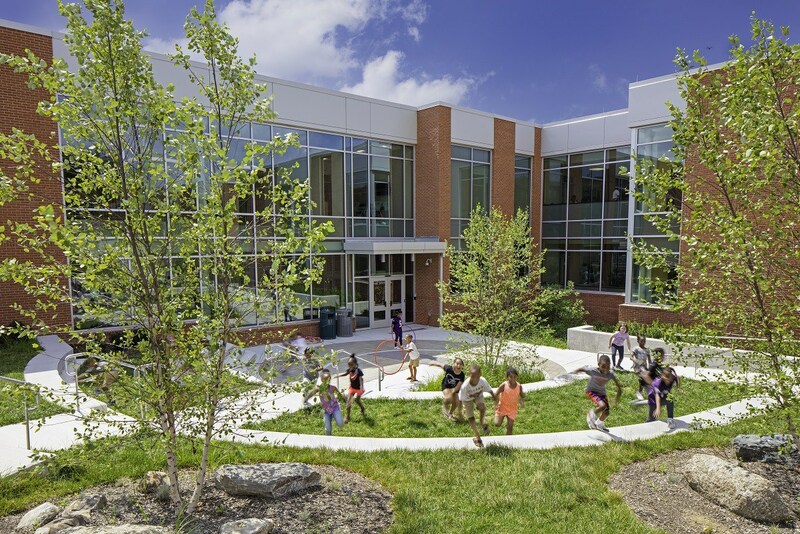 The architects renovated an existing building and designed an addition to accommodate the merging of two area elementary schools and create a new actor for the community. The new award was created in collaboration with the Neighborhood Design Center (NDC), a nonprofit group that traces its origin back to a speech given by civil rights leader Whitney M. Young Jr. at the 1968 AIA National Convention. Young’s fiery wake-up call, which challenged architects to embrace diversity and social responsibility to improve American cities, was heeded by a group of Baltimore designers who formed the NDC to help neighborhoods rebuild after the riots. Today, the organization facilitates collaborations between area residents, architects, government officials, and other stakeholders to improve neighborhoods through community-led design and planning. Cho Benn Holback + Associates’ winning project was selected based on its alignment with NDC’s belief that good design can create healthier and more just communities, and that everyone deserves good design. Initiated as part of the $1 billion 21st Century Schools Building Project, Height Elementary is a truly collaborative effort between architect, client, and community. The architects immediately engaged with the students, faculty, and nearby residents, learning about their needs, values, and aspirations through meetings, workshops, and good old-fashioned door-knocking. They maintained this dialogue throughout the design and development process, and the feedback they received had an immediate and profound effect on the building’s design. An existing auditorium, for example, would likely have been demolished had the school not expressed their appreciation for the arts and their need for large gathering spaces. The desire for spaces shared by the school and the surrounding community was another common sentiment among those surveyed. In response, the architects created a “town square” in front of the school and a public park in back; inside, in addition to flexible classrooms that promote different types of teaching, they designed spaces for social outreach programs. The jury, comprising architect Leon Bridges, FAIA, NDC Executive Director Jennifer Goold, and Jessica Solomon, senior program officer of the Robert W. Deutsch Foundation, highlighted the building’s engagement with the greater community as one of the primary reasons for awarding the prize. The Social Equity Design Award recognizes the current sea-change happening in architecture. More and more, professionals are beginning to question how and why projects are recognized and celebrated. Every prize stirs up debate about the purpose of the professional the values and behaviors we want to uphold as paragons of the profession. What is the purpose of architecture? What’s at stake? Who does it serve? In the case of the Dorothy I. Height Elementary School, that answer is clear: it serves the community of West Baltimore.